Many great names echo throughout history. Honour, virtue, persevereance, and knowledge, all put the great men and women of history into the hearts and minds of men for generations to come. Unfortunately, sometimes not even a glimpse of the greatest of people to have ever lived will scratch the pages of history. When we think about those who lived in the presence of the Gods, we may think of Emperor Marcus, Emperor Julian, Plato, and many other pious men. In the ashes of an empire which sought to destroy our very way of life and faith, there was a man who stood firm in the knowledge and soul of his people. This man we know as Gemistus Pletho, the forgotten redeemer. Being born in Constantinople in 1355, he was raised with a good education and by a well off family. Pletho spent much of his early life studying Byzantine law, religion, and philosophy in Constantinople. As he grew older, he began his studies in philosophy in Adrianople/Edirne. This is where he truly fell in love with the classics. From an early life, he was raised on Christian doctrine and values from his parents and from his education. By the time Pletho had returned to Constantinople, it was well aware that he had returned to the Hellenic faith of those whom he admired and loved. During the time Pletho was alive, a great renaissance was alive and well in what was remaining of the Byzantine Empire. This can be attributed to the influence of Ottoman literature and learning, combined with the native Hellenic population longing to return to their once glorious past. Pletho used this Eastern renaissance to his advantage when spreading his ideas on Neoplatonism and the old Gods. He was well known in his time for his vast knowledge on law, philosophy, and religion. This enabled him to have positions in law in Constantinople, which eventually gained him the Emperor’s ear. Although he was always under constant supervision by the Byzantine Church, this did not deter Emperor Manuel II from favouring him. After some time spent training under high officials and the Emperor himself, Pletho settled in Mistras, home of the Spartans, where he set up his own school. His school focused on the teachings of the classics, as well as history, geography, and law. What was most interesting about his school was instead of vigorously reciting and memorising writings, he focused instead on teaching his pupils how to critically think, and analyse the teachings of Aristotle and Plato. An interesting viewpoint is seen in Greece that we have never seen before. We are able to see just how alive and well Paganism had survived, and still lived on in the hearts and minds of many. Even the Christians who studied under him still had a place in their heart for the philosophy and soul of the Hellenic people; Even after many years of the Greek Christians doing everything they could to erase the light and wisdom of the Hellenes. I myself heard him at Florence ... asserting that in a few more years the whole world would accept one and the same religion with one mind, one intelligence, one teaching. And when I asked him “Christ’s or Muhammad’s?,” he said, “Neither; but it will not differ much from paganism.” I was so shocked by these words that I hated him ever after and feared him like a poisonous viper, and I could no longer bear to see or hear him. I heard, too, from a number of Greeks who escaped here from the Peloponnese that he openly said before he died ... that not many years after his death Muhammad and Christ would collapse and the true truth would shine through every region of the globe. Though many scholars doubt the authenticity of this interaction, and further claims that his pupils were made to pray before statues of the Gods, we can still see that he was under constant observation of the Byzantine and Latin Church alike. Going off of the earlier point, Pletho became very interested in ancient writings of the Persians and Zoroaster in particular. Our best guess from analysing his views and life is that he found a connection between the Zoroastrian theology and his Neoplatonist world view, which he was very rooted in. He was able to draw connections from Ahura Mazda and lesser Persian deities, to the sometimes monotheistic tendencies of Neoplatonism. Through his school and his pupils, he was a huge influence in the revival of classical philosophy and contributed to the renaissance that came about later in the West. His famous writing “De Differentiis” played a major role in reintroducing the western world to Greek philosophy after the Latin west had abandoned much of its Greek influences. Pletho spent much of his later life giving many suggestions to the Emperor on reforms that he believed could help revive the Empire. These included military, law, and surprisingly religious reforms. These suggestions, many inspired by Plato's Republic, included a return to a more classically Hellenic social order with a three-tier caste system of Helots, military, and enlightened rulers, and a rejection of Justinian's "universal Empire" in favour of an isolated society of moral purity. He did not include strong statements on religion in his recommendations to the Emperor, certainly to avoid legal persecution, but also because of his view that a return to pagan religion was naturally inevitable shortly after his death. Although none of his suggestions were enacted, they ultimately led him into trouble with the Patriarch. 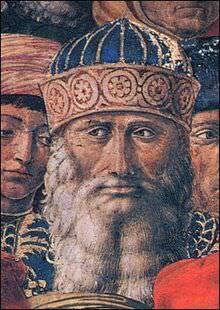 Pletho passed away on June 26, 1452 in Mistras. He left behind a personal book of his, which only very few people were able to see during his life. The book, named “Nómoi” (Meaning book of Laws), was in the possession of Princess Theodora of Morea. Inside this book contained his passion and love for the Hellenic Gods, his beliefs about their eternal arrangement, their role in choosing the bodies of reincarnated souls, and his distaste for Christianity. Upon reading this, the Princess was informed by the Patriarch of Constantinople to burn the book. Even though she did not personally burn it, somewhere along the line it was burned anyway, losing any personal insight into his life. Though much his life is shrouded in mystery, we can see a man who loved his Gods, loved his people, and loved his nation. He will forever live on in the souls of our people as the forgotten redeemer.